Dr. Osamu Tezuka's manga "Jungle Emperor" was adapted for television in the 1960s, spawning the much loved series Kimba The White Lion. Jungle Emperor Leo, picks up where the series left off, completing the second half of Tezuka's tale, focusing on the now fully grown Kimba (known in Japan as Leo), holding his position as king of the jungle. 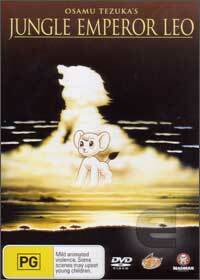 Tezuka’s work, at the very least, influenced Disney’s The Lion King – something unacknowledged publicly by Disney. It is with a hint of cynicism that the opening of Jungle Emperor recalls the opening scenes from the said Disney film – with word of mouth spreading amongst the jungle that an air to throne has been born. The scale of reception provided by Leo’s followers, following the news of new lion cubs, matches anything reached in the circle of life – it is perhaps a sense of one upmanship (anything you can do, we can do better). The wide eyed innocence of Leo’s offspring – Lune and Lyre is endearing. The characters are brightly animated, and bursting with personality – as a result the opening third of the film bubbles with a playful energy. Lune, the more adventurous of the two, discovers a music box from the human world, and develops a curiosity about what humans are like. Through a fantasy sequence, one part humorous, two parts disturbing, we see Lune’s romanticized view of the city – something he wishes he could visit. Every human that inhabits it, looks exactly like the only human he has ever met. It’s Pink Elephants on Parade, meets that scene in Being John Malkovich (where everyone looks like John Malkovich), times ten. My highlight of the film. Lune’s view of the human world is challenged when Hamm-Egg, a greedy human treasure hunter, brings his team of explorers into the jungle. In search of the mythical moonlight stones, he and his team destroy everything in their path, with no regard for those around them. As emperor, Leo must fight to protect the world he loves – but must convince the animal kingdom that a violent confrontation is not the answer. The message contained within - one of tolerance, respect and acceptance of culture, is valuable, given the times we live in. Emperor Leo challenges the “law of the jungle”, to try and create a world were animals and humans can live side by side. Perhaps Madman can ship a copy off to Canberra. Whilst The themes and issues raised throughout cover a lot of ground, sadly the DVD features do not. The original Japanese theatrical trailer provides a look at how the film was pitched to a local audience, but it holds little replay value. Whilst we are provided with both English and Japanese language soundtracks, we are treated only to a stereo mix of both. On the plus side there is no contribution to the soundtrack by Elton John.